Adding vibrance and pops of color around every corner, San Luis Obispo’s painted utility boxes have probably caught your eye. There are currently 27 of these unconventional canvases spread across the city, which have been painted throughout the last seven years. Amidst ordinary streetscape, they amplify San Luis Obispo’s artistic values by displaying local art in public spaces for community members to enjoy. Public Art Program Manager Melissa Mudgett outlined how these transformed utility boxes exhibit the artistic presence in San Luis Obispo. Local artist Charlie Clingman painted a utility box on Broad Street and South Street in 2012 entitled “Spooners.” The utility box he painted showcases a colorful array of local produce. “It’s good to show support to local artists — they benefit the community,” Clingman said. 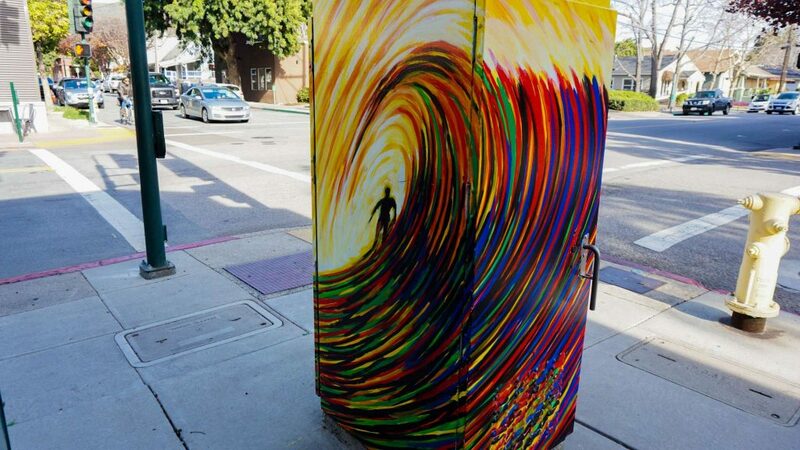 Clingman is one of many artists who have contributed their artistry to the utility boxes of San Luis Obispo. The origin of the painted utility boxes began in 2010 as part of a larger capital improvement project that focused on the beautification of downtown. The city of San Luis Obispo started the SLO Box Art program as a pilot program, which became very popular allowing it to thrive and expand. 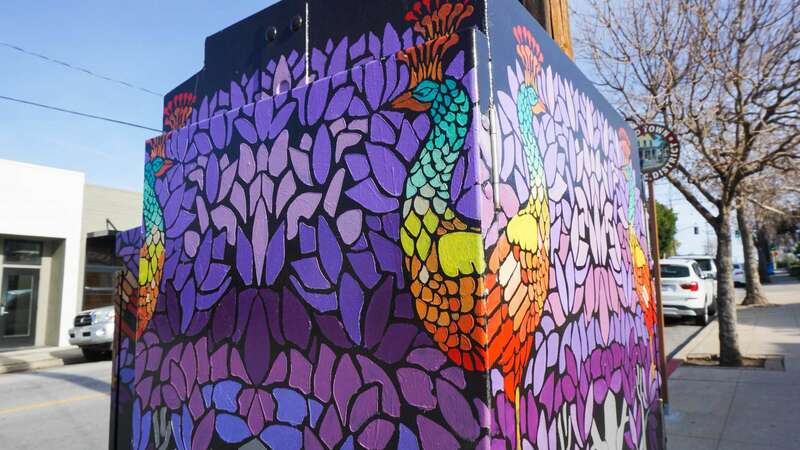 This year, the program aims to find artists to paint the remaining blank 27 utility boxes. The original application deadline was Friday, March 9 at 5 p.m., however, the deadline has been extended to Friday, March 23 at 5 p.m., in hopes of receiving student applicants. “We outreach and try to leave a couple spaces open specifically for students and that would include Cuesta, Cal Poly and SLO High,” Mudgett said. 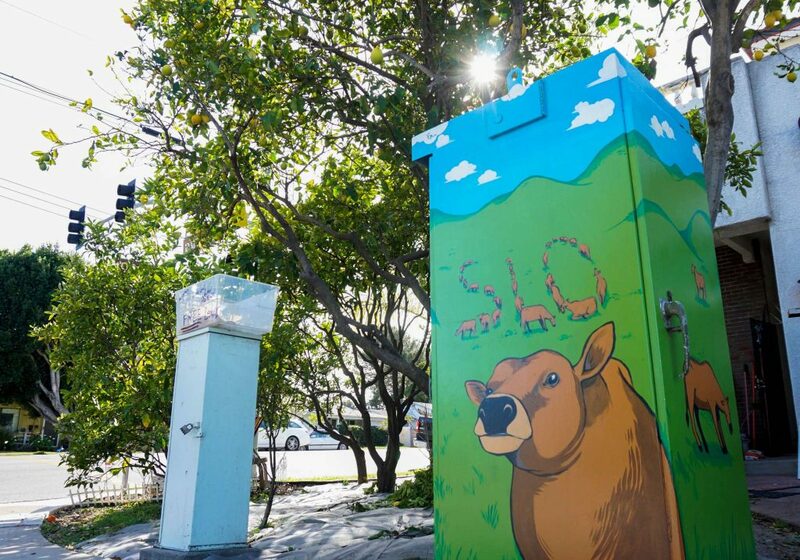 Art and design senior Elena Aker painted the utility box entitled “SLO Many Cows” in 2016. She said her favorite part about being involved in SLO Box Art is getting feedback from people who have seen her artwork on the street. She hopes it encourages other students to join. If the applicant is younger than 18, they must pair up with another artist that is 18 or older. Artist selections will be announced approximately two weeks after the application deadline. The chosen applicants will bring their designs to life July 2018. Clingman weighed in with some advice for applicants to keep in mind while they are coming up with a design for a utility box. An art selection jury consisting of approximately 15 people will review the applications and recommend which designs should be selected to the SLO City Council. Mudgett said that the SLO City Council has chosen all the designs recommended by the art selection jury in the past. The SLO Box Art Program is currently looking for volunteers for the art selection jury as well. To get involved contact Mudgett at mmudgett@slocity.org. The City of San Luis Obispo Utilities Department is also seeking artists to submit storm drain decal designs to update the current storm drain placard through the Watershed Awareness Through Art program (WATA). Storm drain decals are markers that are placed next to or on storm drains. The new designs will replace existing storm drain decals on storm drains that flow straight into a creek. These are much smaller scale projects, ranging approximately four to eight inches. WATA’s goal is to raise San Luis Obispo’s awareness about natural resources, healthy watershed and how the community can handle them. The deadline for the storm drain decal designs has also been extended to March 23 at 5 p.m., and the application can also be found on the city of San Luis Obispo website. Both the SLO Box Art program and WATA utilize local art to enrich the community, according to Mudgett. She advised artists to keep in mind designs that are true to the community to enhance the environment we are surrounded by.